Saturday, November 25, 2017, 8:00 a.m.
OUR GOAL THIS YEAR IS TO COLLECT 100's OF CHILDREN'S GIFTS FOR 100's OF CHILDREN IN NEED! We're joining the Montclair Police Department, PBA #53 and Montclair Salvation Army's Seventh Annual Santa visit. Just bring a new unwrapped present to the Pancake Breakfast. Fleet Feet Montclair opened our doors for business in November, 30 years ago. Each year we have a tradition of celebrating with the community that sustains us. This year, especially, we are looking forward to sharing warm pancakes after a crisp fall run! Join us! The 3 mile FUN run is a non-competitive, family-oriented event that will begin and end at Fleet Feet Sports, Montclair. When participants return to the store, John & Dawn and our staff will be flipping pancakes, pouring coffee, and toasting with a little bubbly. 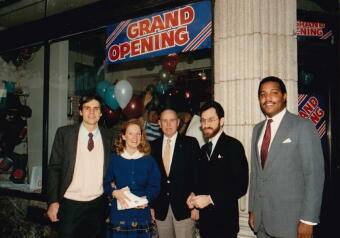 Mayor Robert Jackson cut the ribbon for our store opening on November 1, 1987. Thirty years later, he's doing the honors again for Fleet Feet Montclair's Grand Reopening at 9:45 am, right after the pancakes are gone. Come help us take the first step into our future run!